Similar in design to the aluminum group series of chairs, the soft pad group offers the same aesthetic with the addition of plush, individually upholstered cushions to the seat and back. 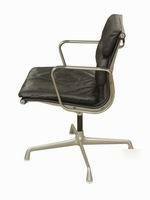 We have other chairs in the Soft Pad and Aluminum Group family. return the item and receive a full refund. Please contact us after receiving the item and do not accept if the package looks damaged. For large pieces we recommend a blanket wrap service. To schedule a pickup please visit the link below or contact us for recommendations. Mint: The piece looks like it came right off a showroom floor. Original finish, with original luster and no wear or flaking. There are no nicks, gouges, or scratches. Excellent: Nearly perfect with minor blemishes. Piece may be refinished. We will note if the piece has been refinished or needs reupholstering. Very Good: Showing some signs of age. Superficial surface scratches and blemishes are more visible than if in excellent condition. Finish may have minor flaking but the piece is otherwise acceptable. Cleaning or polishing will improve appearance. Good: Definite signs of age and use. Visible scratches and stains but piece will be usable without being refinished. May need repairs. Poor: Major signs of age and wear. Will need to be refinished and/or repaired.